Why use them: They pack a super-punch of delicious heat, perfect for chile-heads like my friend Paula and me. They’re also super-cute! So a couple times a year I get to see my friend and colleague, Paula B., who hails from the mysterious land of Minot, North Dakota. You may have read about this place in a storybook or seen it in a science fiction movie, I don’t know. I’m not sure what or where it is, exactly, but she says she lives there. In the land of Minot, they practice this ancient ritual called “canning” which I have heard of, but have never practiced. I think I first learned of it from a cave drawing or a petroglyph or something. Anyway, Paula still does it because where she lives she can’t always get the freshest or best-quality produce year-round. It’s a way to preserve produce for later in the year, and also a way to set aside delicious jams, jellies, veggies, and more. Paula and I tend to see each other at work-related events far from either of our homelands, and we always make time to compare notes on recipes and our love of chile peppers. On a recent business trip to Orlando, Paula brought me a fabulous gift of her very own Peach-Habañero Jam, labeled “XTRA SPICY” and even offered to share the recipe! 1. Combine peaches, sugar, and honey in a Dutch oven; stir well. Cover and let stand 45 minutes. Position knife blade in food processor bowl; add orange quarters and chiles. Process until finely chopped, stopping once to scrape down sides. 2. Place orange, habañero chiles, and an equal amount of water in a medium saucepan. Bring to a boil; cover, reduce heat, and simmer 10 minutes or until orange rind is tender. 3. Bring peach mixture to a boil over medium heat, stirring until sugar dissolves. Increase heat to medium-high, and cook, uncovered, 15 minutes, stirring often. Add orange mixture. Bring to a boil; cook, uncovered, 20 to 25 minutes or until candy thermometer registers 221 degrees, stirring often. Remove from heat; stir in almond extract. Skim off foam with a metal spoon. 4. 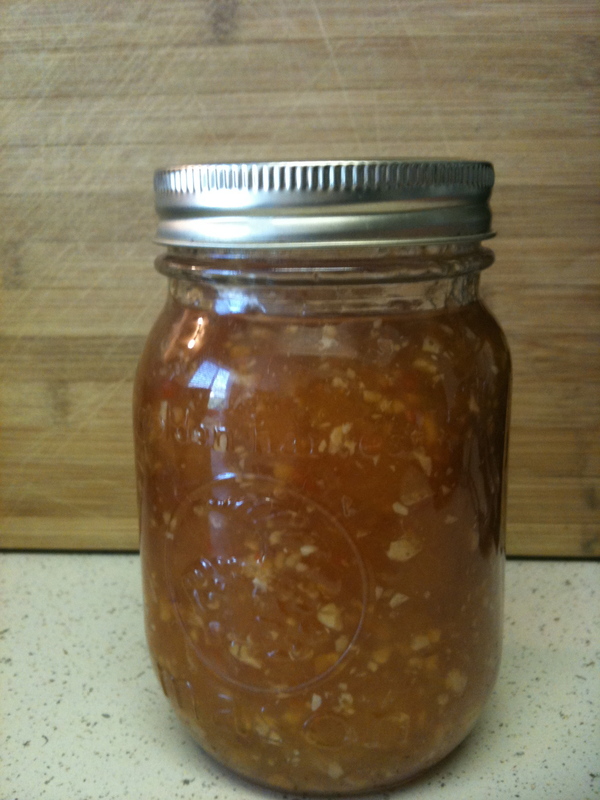 Quickly pour hot mixture into hot, sterilized jars, leaving 1/4-inch headspace; wipe jar rims. Cover at once with metal lids, and screw on bands. Process jars in boiling-water bath 5 minutes. Yield: 6 half-pints. This jam is fantastic. It has a great backdrop of heat that goes nicely with the complex sweetness. I enjoyed my fist taste with some creamy brie (see photo) and it was a worthy pairing. Let’s talk about habañeros. Apparently they are often mistaken for Scotch bonnet peppers. These two are easily confused because they are similar varieties of the same species. They are also similar in appearance and heat level. So what’s the difference? How do you really know if what you’re buying at the supermarket has the correct label of habañero or Scotch bonnet? My opinion? They’re so similar, who really cares? I love heat. I ate hot chile on a nearly-daily basis for the ten years that I lived in New Mexico, and I built up quite a tolerance. However, these peppers intimate me and bring out my inner wuss. 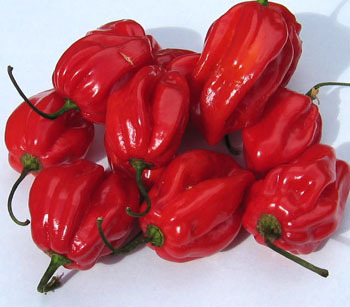 I use habañeros or Scotch bonnets in only a couple of recipes, such as my jerk pork. A half to one whole pepper spices up about 8 servings. (I may share that recipe at a later time, but I warn you in advance, it’s not authentic.) I also make a simple pineapple salsa with habañero, lime, and cilantro to top fish tacos. So let’s talk about just how HOT habañeros are. The scale used to measure the heat of chile peppers is known at the Scoville Index – named for Wilbur Scoville, a chemist who developed a method to measure the “heat” of the chile pepper (I’m sure it’s very technical to understand, so let’s not bother, ok?) 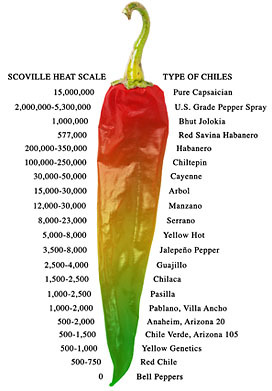 Let’s suffice to say that the Red Savina Habañero mentioned above places at 350,000 – 575,000 heat units on the Scoville scale, as compared to a jalepeño, which scores 3,500 to 8,000 (wow – big difference!) That’s some serious heat, folks. It was once explained to me that capsaicin, the chemical in chile peppers that makes us taste heat, attaches to the tongue in such a way that the molecule is not “knocked off” when we drink water. That’s why cold water really does nothing to dilute the heat. However, fat molecules will dislodge the capsaicin from your tongue, so milk will cool down your mouth (or, even better, ice cream). Sour cream, of course, will also have that cooling effect to ease the burn brought on by chile heat, which is probably why we see it paired with spicy Mexican dishes. Or think of a cooling yogurt raita served alongside a spicy Indian dish. 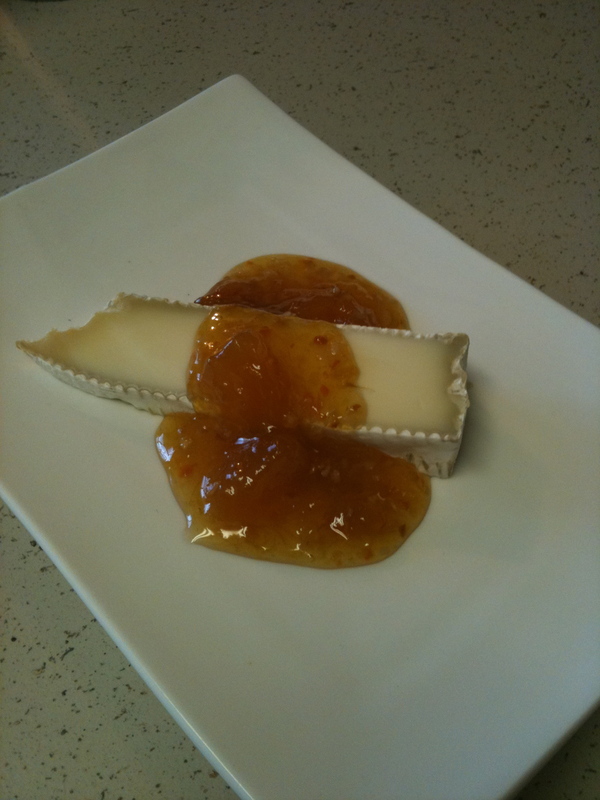 Or the creamy brie mentioned above, served with Paula’s spicy jam. Is this making sense now? Anyway, I’m not exactly Mr. Science, so you may want to check my facts before you quote me on any of this. All I know is I loves me that hot chile pepper kick from time to time!